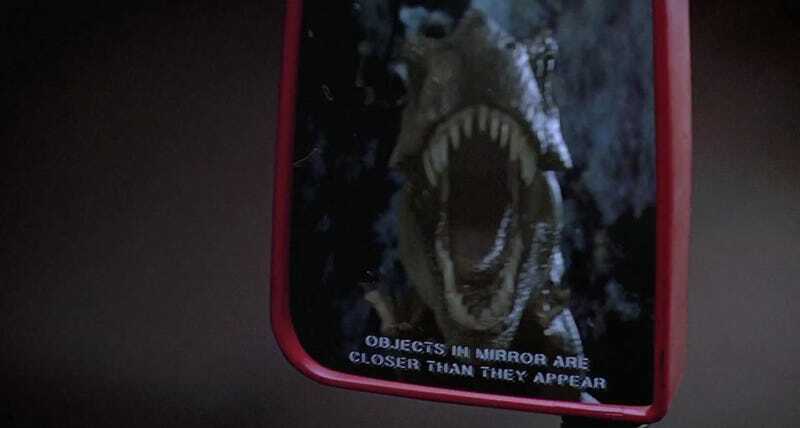 The passenger-side mirror of every modern car in America bears the same warning: "Objects in mirror are closer than they appear." Ever wondered why? It's no design fault; it's actually a safety feature. The reason behind the warning is a simple matter of physics—and the placement of the passenger-side mirror in relation to the driver's eye. When light bounces off of a flat surface, the angle of the reflected light is equivalent to the angle at which it struck the surface. That is, if incoming light hits a flat mirror at a 45-degree angle, your eye has to be at the opposite 45-degree angle in order to see that image. It's called the "focal point," and on flat reflective surfaces that point is literally the exact spot that the incoming light strikes the surface. Automakers have long exploited this physical property of light by making driver-side mirrors flat, as the flat surfaces generate highly accurate reflections—albeit with a smaller focal point and rapidly diminishing viewing angle, the further away you get from the mirror. Since the driver's eye is usually only about three feet from the driver-side mirror, it's not much of an issue. Passenger-side mirrors, on the other hand, are roughly twice that distance from the driver's glance, and viewed from a severe angle. Were they completely flat—like the driver-side mirror—they would only show a sliver of what was going on on the road, creating a blind spot big enough to hide a Mack truck. Instead, to compensate for angle and distance, the passenger-side mirror is actually convex in shape—it bulges slightly in the center compared to the edges, like a contact lens. The convex shape extends the focal point so that light striking the curved surface from a wider swath of angles all converge at the same focal point and then bounce into your eye. But this too comes at a price. While a flat surface generates an accurate reflection at the cost of viewing angle, curved surfaces offer a wider viewing angle at the expense of visual accuracy. Basically, the wider focal point compresses the reflected image, which makes objects appear smaller and farther away than they really are. Hence, the warning. On the other hand, convex mirrors do a much better job of minimizing blind spots than their flat, aka planar, alternatives. They do such a good job, in fact, that in 2010 the US Department of Transportation began researching whether or not American cars would benefit from using a pair of curved mirrors, just as those in Europe do.